U.S., Russia Working On A Plan To Coordinate Bombing In Syria : Parallels The Americans and Russians are both waging air campaigns against the Islamic State. But the two powers are deeply suspicious of one another and have different goals for Syria's future. The U.S. and Russia are working on a controversial plan for greater military cooperation in Syria, where both powers are bombing the Islamic State but have starkly different views of the country's future. The Washington Post on Thursday published what it said was a copy of the eight-page document. The Americans and the Russians would set up a joint headquarters, possibly in Amman, Jordan, and share intelligence and targeting information for airstrikes against ISIS and other Islamist extremists, according to the document in the newspaper. "At present, the United States is not conducting or coordinating military operations with Russia," White House spokesman Josh Earnest said Thursday in response to the report. "I know there's some speculation that an agreement may be reached to do so, but it's not clear that that will happen." While Washington and Moscow share the goal of defeating ISIS, they don't trust each other and are at odds on large questions such as a postwar Syria and whether it should include President Bashar Assad. Russia thinks it should; the U.S. says it shouldn't. U.S. Secretary of State John Kerry was set to meet Russian President Vladimir Putin on Thursday in Moscow for talks on the proposal, which could shift the U.S. role and potentially change the trajectory of Syria's 5-year-old civil war. A partial cease-fire was announced in February, but fighting has been heating up again, particularly around the northern city of Aleppo. Bits and pieces of the U.S.-Russia plan have been leaking out in recent days, and there are many skeptics in the U.S. who feel the most likely outcome would be to help Russia achieve its aim of bolstering the embattled Assad. The Russian and American militaries have established communications channels to reach each other in emergencies and also notify each other of their whereabouts on the ground. But they have mostly tried to keep their distance and the coordination has been far from ideal. The Russians often attack so-called moderate rebels backed by the United States, thereby undermining the American effort against Assad, according to the U.S. The Americans want the Russians to focus much more on ISIS. In turn, the Russians have argued that alliances among the rebels are so fluid it's difficult to distinguish between the various groups. "Russia has been trying to get the United States to cooperate with its forces since the beginning of Russian involvement in the Syrian conflict," wrote Stratfor, a U.S. group that tracks global affairs. "If Moscow could get Washington to work directly with Russian and Syrian loyalist forces, that would, in turn, force Washington to recognize the government of Syrian President Bashar Assad." ISIS has been on the defensive in Syria, as well as neighboring Iraq. And a coordinated U.S.-Russia bombing campaign could further exploit Islamic State weaknesses, shrinking its territory and ability to attack. 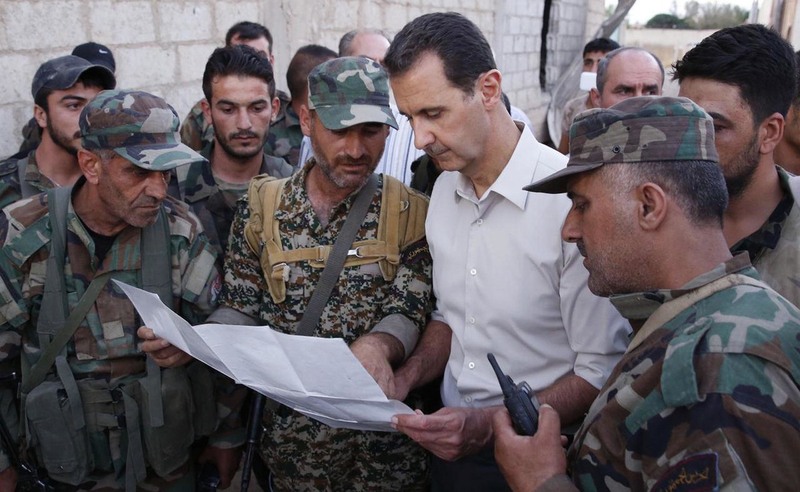 But the net result could be an Assad who regains control over more land and strengthens his hold on power, an outcome the Russians would welcome. In this scenario, the Russians and Putin would reassert themselves as a major player in the Middle East and gain leverage in the region at the expense of the United States. For the Russians, the downside is that Syria is already a shattered nation with hundreds of thousands dead and millions displaced, and Moscow lacks the resources to rebuild it. Syria could be more a liability than an asset for Russia. Meanwhile, President Obama has declared that Assad has lost all legitimacy and must go. But the president has always been reluctant to become deeply involved in Syria. He has deployed limited U.S. air power, along with a small number of covert forces on the ground. And the target has been ISIS, not Assad. On the diplomatic front, repeated attempts to work out a political solution removing Assad have come up empty. According to document in the The Washington Post, Russia would be expected to pressure Assad to stop attacking moderate rebels and allow aid into rebel areas that have been under siege from the Syrian army. But many in the U.S. military are wary of working closely with the Russians, saying they do not trust Moscow to deliver on such promises. The counterargument is that the U.S. has no good options in Syria, and cooperating with Russia to pound ISIS is the most practical way to work toward ending the war. NPR's diplomatic correspondent Michele Kelemen and National Security editor Philip Ewing contributed to this report.